Rt. Wor. 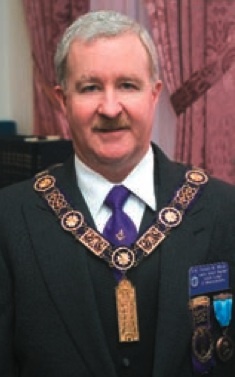 Donald M. Moran, Past Master and long-term Treasurer of Budleigh Lodge, Beverly, serves as Junior Grand Warden. He was District Deputy Grand Master of the Salem 8th Masonic District for three years and is a graduate of the Most Wor. Arthur E. Johnson Class of the MLI. A member of the York Rite and Aleppo Shrine, where he was in the Clown Unit for four years, Bro. Moran has labored in the Scottish Rite Valleys of Salem and Boston. He has been an active degree worker in all bodies of the Valley of Salem, and has served as the Most Wise Master and Director of the Work in Emmanuel Chapter of Rose Croix. A 33° Mason, he has served as Associate Engineer and Seneschal in Massachusetts Consistory, Standard Bearer in the Massachusetts Council of Deliberation, and Deputy’s Representative for the Valley of Salem. He has served as a Corporator of the Beverly Hospital, a member of the Beverly YMCA Fundraising Committee, President of Beverly Rotary Club and Executive Committee member on the Georgetown Athletic Association. Bro. Moran owns Colonial Press in Beverly, and lives in Georgetown with his wife Meg, son Peter and daughter Kelly. This page was last modified on 3 February 2016, at 10:37.